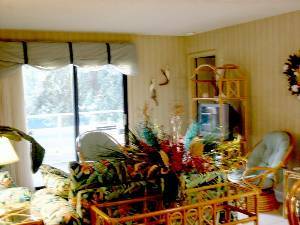 Spacious, 2 BR, 2 BA, very attractive 2nd floor (of a 3-story) condominium. The Master bedroom has a queen-size bed and a new TV and an adjoining full bathroom. The second bedroom has two twin beds and a second full bathroom. This is one of the "Larger" units at Fiddler's Cove. 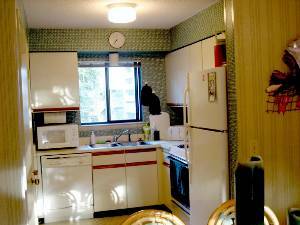 The unit has recently been redecorated, and has tile floors and new appliances. We live in our unit for nearly six months each year so we do maintain and care for it like it is "our own". We are located on a 23-acre resort within a gated community with 24-hour security. Fiddler's Cove Beach & Racquet Club's prime central island location makes it a favorite family destination. 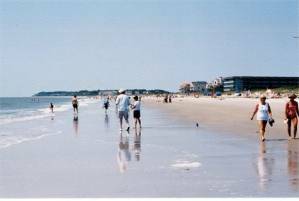 And best of all, we are just a very short walk to Hilton Head's widest and loveliest stretch of white sand beach. We are near restaurants, shops, golf courses, kayaking, windsailing, dolphin watch, boating, deep-sea fishing, nature walk, biking, outlet stores, and more. You can fall out of bed onto the # 9&10 tennis courts. 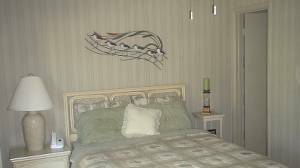 Amenities: Our condo has a fully equipped kitchen including refrigerator with icemaker, new dishwasher, microwave, coffee maker, toaster, pots, pans, dishes and all utensils. It also has an apartment size washer and dryer, wet bar, answering machine and full dining room. The Living room has a queen sofa sleeper, cable TV, and DVD-VCR. 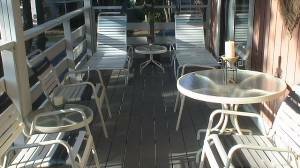 The unit has a large deck furnished with a dining set and lounges. It is like an open air living room. On-site caretaker for our unit. Island wide bike path is located near the entrances to Fiddler's Cove. A driving range and fun center (including miniature golf) is within walking distance. Our unit is located very close to Fiddler's back gate thus making the walk to the beach very short. 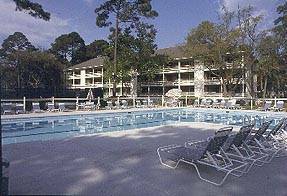 Area: Fiddler's Cove Beach and Raquet Club is located in the Folly Field area of Hilton Head Island. This is a residential only area with the nicest beach on the island. 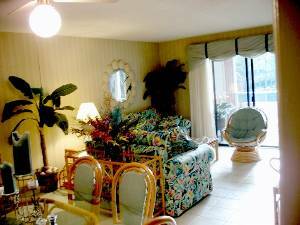 It is a two minute walk to the beach from our unit. number of restaurants, shops and, just off island, two large outlet malls. There are several wildlife and nature preserves located within minutes of Fiddler's Cove. 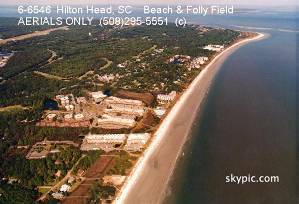 There are over fifty golf courses to play on Hilton Head Island and vicinity. Hilton Head Island is located at the extreme southern tip of South Carolina, about 30 miles north of Savannah and 100 miles south of Charleston. At seven miles in width and fourteen miles in length, it is the second largest Atlantic coast barrier island. This semitropical barrier island resembles an artistic masterpiece with its oak and pine woodlands and meandering lagoons. It is part of the Low Country, the picturesque region of flat plains and tidal salt marshes that stretches across the eastern expanse of South Carolina and Georgia. Hilton Head Island is almost bisected by Broad Creek, which is navigable for most of its length and is home to several upscale marinas. Hilton Head is shaped roughly like a tennis shoe, with the ''toe" known as the south end, the ''ball" of the foot as Forest Beach, and the ''top" as the north end. There is no ''downtown" on Hilton Head. Shopping and other activities are spread throughout, although more heavily concentrated on the south end of the island. Located in the heart of Hilton Head Island, the Self Family Arts Center is a remarkable showcase for the visual and performing arts. Hilton Head Island is separated from the mainland by the Calibogue sound and the Intracoastal Waterway. Between Hilton Head and the mainland are two other islands. Daufuskie Island is accessible only by water. Part of this island remains in its natural state as a large wildlife preserve; and part has been developed to a limited extent for tourism. Pinckney Island is accessible from the bridge linking Hilton Head to the mainland, and is a National Wildlife Refuge popular among bird watchers. Hilton Head Island has 8 marinas, more than sixty five golf courses,over 400 tennis courts and miles of bicycle and walking paths. The island also features two stables and ample areas for horseback riding, including forest preserve and waterfront. Fishing, , water skiing, horseback riding, miniature golf and, of course, dolphin watching and beach walking are also popular with vacationers and residents alike. Deposit: A $400.00 payment is due within one week of making the booking. Cancellations and Refunds: No refund if cancelled within a twenty five day period of scheduled arrival.